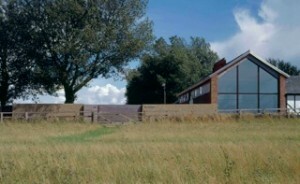 The Duke of Bedford Model barn has sat with its rolling hill views over Bedfordshire for 170 years, used for the majority of its life as a grain store for the local farm. With the intensification of farming and centralisation of stores the barn was in recent times become derelict and a new lease of life was awaiting. Set back from the rural road and with some 6 acres the barn acts as a beacon on top of the hill during the day and particularly at night when lit up. The barn is some 40 metres long and 6 metres wide. Constructed from local ʻsoft redsʼ (bricks) with a 9ʼʼ lower brick plinth and oak timber frame with brick infill. The roof (which has been entirely retained and fully visible from the inside) is made of a series of elm trusses at 3.5 metre centres with inch thick, foot wide boarding running the entire length of the barn. The sketch design for the project sought to ʻslideʼ a new home into the old building, retaining all that was possible. The barn originally covered some 275m2 which after excavating the ground floor to an almost semi basement and introducing a new first floor level increases this to 387m2. The excavation meant we were left with a building of two and a half storeys high. The first floor level enjoys for the glory of the original roof, whilst in certain areas of the ground floor there are openings upwards which create generous spaces which reach from ground floor up to the old roof level. The barn sits on top of a hill which suffers from high shrinkable clay and artesian water. These issues instigated foundations as deep as 2.5metres which run in parallel from one end of the barn to the other in long underpinning strips enabling a suspended beam and block floor which will not be affected by clay movements. This suspension of the floor also enabled a control mechanism of upward seeping ground water which would be ʻallowedʼ to collect under the building and runs into chambers which then pump the water to a lake which is effectively the soak-away for the building. the ʻbridgeʼ. The first floor has 4 bedroom with 2 wash facilities and a floating ʻbridgeʼ that connects them. Each bedroom has its own views of open landscape and the lake. Each window is framed to throw your eye out to the view beyond, each window unit also encompasses a recessed roller blind and hidden lighting that floods the roof line above. Construction The barn volume meant serious consideration was needed on how to heat and insulated the building. The insulation significantly exceeded the standard requirements with high levels of insulation, highly insulative blocks and triple glazed units. Heating is provided by under-floor hot water heating through an oil-condensing boiler. The use of natural materials, which are healthy to humans, was upper most in my thoughts when designing. Non-toxic, low allergen healthy products were investigated thoroughly. Lacquers you could drink without harming yourself, sustainable timber and of course re-use of timber all formed part of the brief, there is even the use of organic paints! There are also centralised control systems, lighting, heating, air movement, vacuum and computer systems all built in. 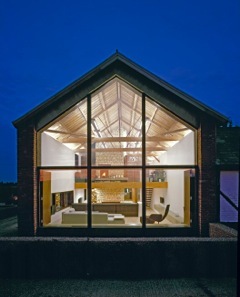 Lighting design with barns is often awkward due to the spaces and rooflines. This is intriguingly solved in some areas by the use of a 22metre suspended fitting that travels through the long barn in circulation spaces, over the bridge and into triple height spaces. On ground floor level 8 metre long recess fittings connect living areas, these are all controlled by central Lutron panels which enable you to scene set. Fluorescent lighting was an unusual selection for the building but with it being 80% more efficient than standard lighting, dimmable which meant more control and less energy, very low heat output all equated to an ideal product. 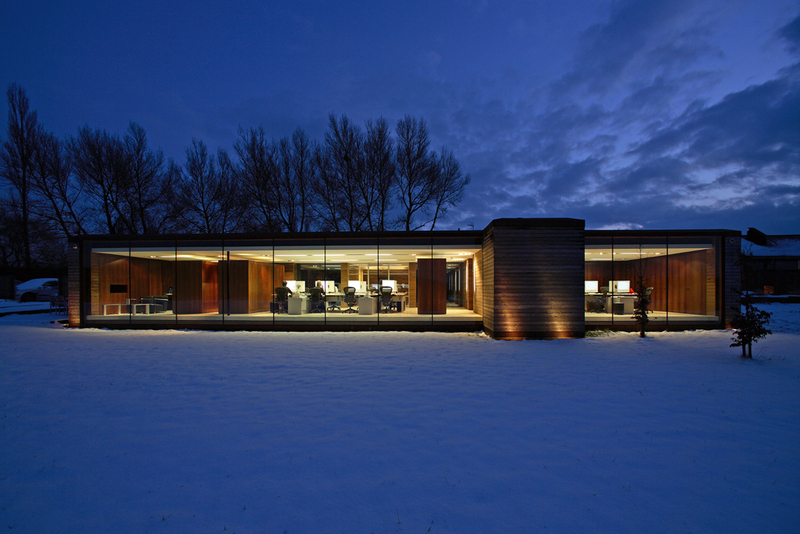 For a residential scheme the lighting is certainly unusual.